So you want to be a food writer – you're into homemade sushi, love to make chocolate anything, read every cookbook and follow every food blog. WOW! We have a prize for you! 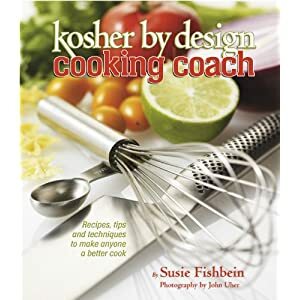 If you live in the New York/New Jersey area or want to travel to that area on October 23rd, Artscroll Mesorah Publications and KosherEye are offering one lucky person a chance to be a VIP reporter at the launch of Susie Fishbein's new cookbook, Kosher by Design Cooking Coach. The selected winning entry will be the official KosherEye reporter for this official press event. The Kosher by Design, Cooking Coach launch will take place on Tuesday evening, October 23rd, at the Pomegranate Supermarket in Brooklyn, NY, a store that Susie deems the "Disneyland for kosher foodies". The reader submitting the winning entry will attend the event, enjoy Susie's demo, taste the food, take pictures, meet Susie, have a personal photo op with her and receive a fresh off the press autographed copy of the cookbook. So put on your reporter's caps, sharpen your pencils, and enter to be the lucky winner. We are taking "applications"! Just tell us in 100 words or less why YOU should be that reporter. Oh, and by the way, the lucky winner will also have a spotlight feature, with his or her own byline, on KosherEye.com sharing the evening's highlights. 1st Prize: Attend the press event, enjoy Susie's demo, taste the food, take pictures, meet Susie, have a personal photo op with her and receive a fresh off the press autographed copy of the cookbook and receive a spotlight byline on KosherEye.com. Second prize winner, the runner-up entry, will receive an autographed copy of this sure to be a bestselling book. Transportation to and from the venue is at the cost and discretion of the winner. Pomegranate is located at 1507 Coney Island Avenue, Brooklyn. We welcome entries from budding journalists of any age! Entries must be received by Wednesday October 17th, 2012. The winners will be notified by Friday, October 19th.